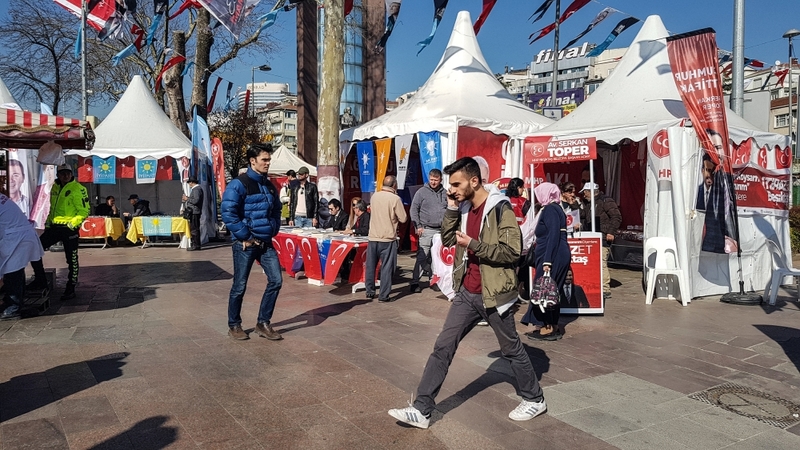 Istanbul, Turkey – Millions of Turkish voters are preparing to elect mayors and local officials on March 31 in a race seen as a new test for President Recep Tayyip Erdogan’s ruling party in the wake of last year’s currency crisis. Campaigning in Istanbul visibly picked up mere weeks before the polls, with political discussions intensifying in the country’s largest city. 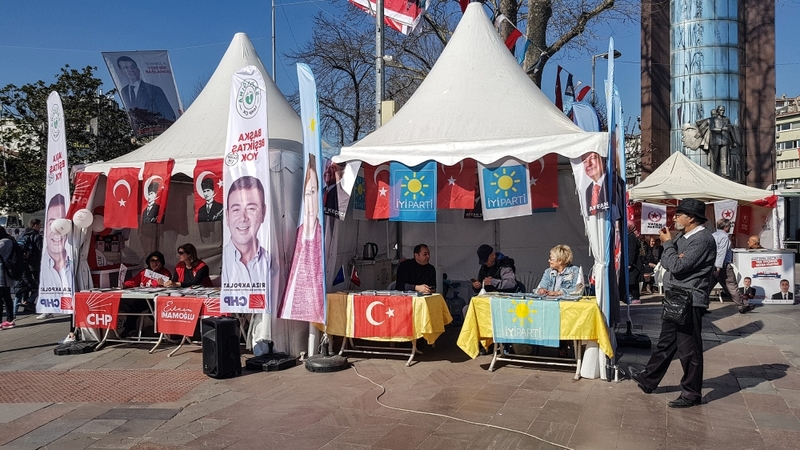 Political parties are making their last efforts to appeal to voters, raising national and local matters during the election canvassing on the squares and streets of the economic capital of Turkey. In addition to city and district mayors, Turkey’s more than 57 million registered voters are expected to pick members of district councils and neighbourhood heads, or mukhtars, in the elections – the seventh one in five years. Erdogan’s Justice and Development (AK) Party has joined hands with its ally in the previous two polls, the far-right Nationalist Movement Party (MHP), in a bloc known as the People’s Alliance. The main challenger to Erdogan’s bloc is the Nation’s Alliance, comprising the centre-left main opposition Republican People’s Party (CHP) and the right-wing Good (IYI) Party. Istanbul and the capital, Ankara are seen as the most intense battle arenas between the two alliances. Al Jazeera examines the main issues dominating the political agenda ahead of the critical polls. The Turkish economy, which slipped into its first recession in a decade, has topped the election agenda so far. Although the government’s move to increase interest rates helped the currency regain some of its value, it also caused a massive decline in bank loans and a loss of business confidence. The depreciating currency has put pressure on businesses hit by foreign currency-nominated debt, while high inflation has decreased citizens’ purchasing power, curbing consumer spending. Turkish GDP per capita fell to $9,632 in 2018 from $10,597 in 2017 in nominal prices due to the lira crash. The Turkish government, confronted with high inflation ahead of the local polls, has set up stalls through municipalities to sell fruits and vegetables at prices lower than the market as the government blamed speculators and middlemen for skyrocketing prices. “The government sees the economic problems common people are facing and is trying to help through these grocery stalls. I do not see any harm with these tents. They are set up to help citizens,” Nedime Sahin, a 36-year-old housewife, told Al Jazeera. “We know that some of our voters are not happy with the recent economic developments. We cannot ignore that,” Yasin Aktay, an Erdogan adviser, told Al Jazeera. Erdogan, who has ruled the country as prime minister and then president since 2003, has led Turkey’s economic transition and growth as an emerging market. Gamze Akkus Ilgezdi, deputy chairperson of the CHP, believes it is not possible for a government that led the country for 17 years and created the current economic crisis, to solve it. “Turkey has never felt poverty this much. People only buy essential needs from groceries. People want action from the people who hold the power, not promises, and they surely do not believe the solution lies with this government,” she told Al Jazeera. In 2017, Erdogan himself said the AK Party was suffering from what he called “fatigue”, and forced some mayors and officials to resign after a key referendum allowed him to claim the chair of the party as the Turkish president. “It is not that the leading party is doing great, but there have been various internal struggles within the CHP, which make people vote for the AK Party instead. Also, it is the only running party with governing experience in the last two decades,” Beyazit Kocaoglu, a 24-year-old university student, told Al Jazeera. The political discussions over the state’s “beka”, which means survival and abidance in old Turkish, refer to internal and external threats against the Turkish state and have generally been brought up by government officials to criticise opposition parties. AK Party officials claim that parties in the Nation’s Alliance are cooperating with the pro-Kurdish People’s Democracy Party (HDP), which they say is a political wing of the outlawed Kurdistan Workers’ Party (PKK), a group that has fought Turkey for independence and then autonomy for over 30 years. Nation’s Alliance leaders have denied these claims. The HDP, which has denied links with the PKK, has decided not to present candidates in Turkey’s six largest provinces, Istanbul, Ankara, Izmir, Bursa, Antalya and Adana, instead throwing its support for candidates running against Erdogan’s People’s Alliance. The Nation’s Alliance calls the beka debate a government effort to divert attention away from the suffering economy. “This is part of the government rhetoric aimed at polarising our society. Turkey does not have any beka problem, Turkey’s problems are about economy, production and welfare,” CHP’s Ilgezdi told Al Jazeera. They say members of the Gulen movement, a former ally of the AK Party, have been running “a parallel state” within the civilian and military bureaucracy and following their own agenda. Gulen, who lives in exile in the US, rejects the claims. Officials say, in addition to internal threats such as the PKK and the Gulen movement, the government faces multiple threats from outside, including countries who supported the opposition in past elections and work to see the AK Party fail in polls. “Past several elections have been used as instruments by foreign powers as well as internal groups to intervene into Turkish national politics. The coup attempt, PKK terror, and rise of far-right in the West have contributed to this,” Aktay told Al Jazeera. “We saw some European countries openly giving support to the HDP while banning AK Party activities within their borders. We also know that some Gulf Arab countries work to see the AK Party fail,” the adviser added, without elaborating. After a ceasefire and talks between the PKK and the state broke down in July 2015, the predominantly Kurdish southeastern region descended into violence, while several cities across the country witnessed bomb attacks. The violence has calmed down after major security operations in the region in the following years. The government has detained hundreds of HDP officials over “terrorism charges” since then and placed scores of trustees in the vast majority of town and city municipalities held by the HDP under the state of emergency rules. During election campaigns, government officials, including Erdogan, said they might do the same if candidates linked to “terrorism” claim offices in the upcoming polls. AK Party’s Yasin Aktay, who is from the region, believes people in southeastern Turkey are happy with trustee services and peace after years of violence, although the government had to remove elected mayors in order to achieve this “during the height of terrorism”.